We dream of cruising the Caribbean, traversing the Panama Canal, exploring the Sea of Cortez, and seeing the Galapagos Islands. Neither of us grew up sailing; we came to it in our early- to mid-50s, starting out on sturdy, sailing school Rainbow 24s, before moving on to Mestiza, a well-loved Catalina 27 that we bought rather impulsively one freezing February morning in the upper northeast corner of the Chesapeake bay. We bought our forever-boat, a Catalina Morgan 440, in Florida from afar, and renamed her Vinyasa. There is so much we love about sailing: the exhilaration of movement over water on sunny days with only the sounds of water and wildlife, the serendipitous joys – and challenges – of altering plans based on weather, the mental engagement of constant learning, and the satisfaction of seeing our skills steadily improve as we practice. 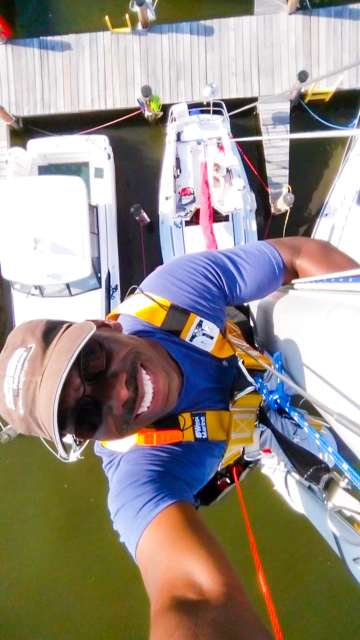 The highs are accompanied by plenty of challenges: sailboats require vigilant care, consistent maintenance and frequent repairs. We have learned from and been inspired by those who have generously shared their sailing experiences, challenges and adventures, and we aim to encourage others to explore, enjoy, and ultimately transform dreams into reality.